**Don't attempt on a humid or rainy day for best results. Preheat the oven to 225 degrees F (110 degrees C). Line 2 cookie sheets with parchment paper or aluminum foil. In a large glass or metal bowl, use an electric mixer to whip egg whites until foamy. Add cream of tartar, salt, and vanilla. Continue whipping until the whites hold soft peaks. Gradually sprinkle in the sugar so that it does not sink to the bottom, and continue whipping until the mixture holds stiff shiny peaks. Place a round tip into a pastry bag, and fill the bag half way with the meringue. To pipe the witch hats- place the tip to the parchment paper an let a blob build up, while bringing pastry tip up and releasing pressure. This will create the tip of the witch hat. Practice makes perfect in this case :) Do not worry about making all of the pieces exactly the same. Bake for 1 hour in the preheated oven, or until the caps are dry enough to easily remove from the cookie sheets. Set aside to cool completely. Melt the coating chocolate in a metal bowl over simmering water, or in a glass bowl in the microwave, stirring occasionally until smooth. Dip the hats into the chocolate at a slight angle, keeping about 1/2 inch of the green meringue showing. Repeat with remaining hats. Store at room temperature in a dry place or tin. 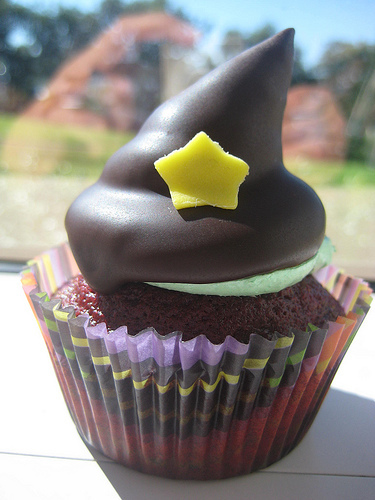 Top chocolate cupcakes with a dollop of frosting or ganache and stick on a witch hat!